Outlook instant search functionality not working. If you have a DrayTek with Firmware Damage and a warning “the router will die after reboot” read on to learn how to resolve it. I have been flashing some DrayTek routers after I received an advisory from DrayTek about new critical firmware updates. The first few went as expected with minimal downtime until one, a DrayTek 2830, disconnected midway through the upload of the firmware. The web page of the router came back with an error “session disconnect”. You must upgrade FW immediately, or the router will die after reboot! I went on site and plugged my laptop directly into the router and tried from that. Same error. I tried using Firefox, Chrome and Internet Explorer with no success. Luckily the router was still functioning and I had a spare router and a configuration backup. I loaded the configuration to the spare router and swapped it out to keep the company online. I took the router back to my office to investigate a bit further. Several different versions of firmware were tried, without any success. 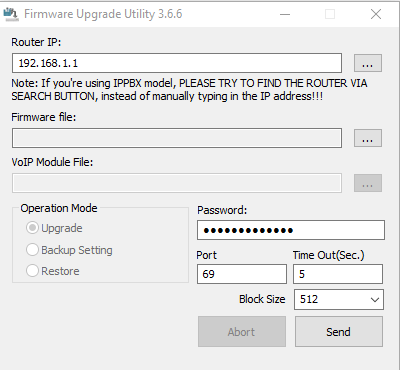 I then found a tool on the DrayTek website called “Firmware Upgrade Utility” (under Router Tools at the bottom of the page). Then I turned off the router and turned it back on with the reset button pressed in (using a paper clip). This booted the router to TFTP mode. Then I ran the Firmware Upgrade Utility and entered 192.168.1.1 in the Router IP. I selected the latest firmware file (with the .all extension) and enter the admin password in the password field. I clicked Send and the firmware updated, and the router rebooted. I was then unable to connect to the router as it had kept the original settings, so, after reconfiguring my laptop network settings, I was able to connect to the router and verify all the settings. No more “Firmware Damage” or “the router will die after reboot”. The router was then swapped out at the client’s site and all is back up and running. No problem. Glad it helped someone out.